I have a confession. This was the first time that I made pesto. Ever. And I was really surprised and how easy something that tastes so sophisticated can be! Pesto is normally made by blending together pine seeds, parmesan cheese, basil, garlic and olive oil but I wanted to try making a version without cheese. My husband had the idea of adding in sun-dried tomatoes (which he loves) and I thought of adding some leeks and wild bear’s garlic which are currently in season. The dried tomatoes are already quite salty, so there was no need to add any salt. Exact quantities depend on taste, so you just need to keep tasting and adding ingredients until you are happy! The result? 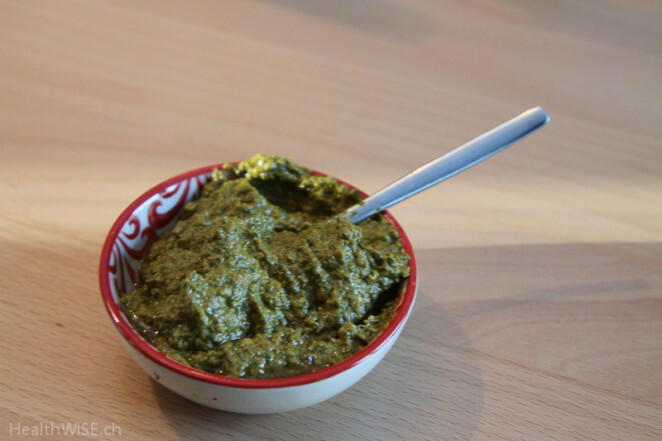 A delicious pesto which can be used as a sauce in several ways. 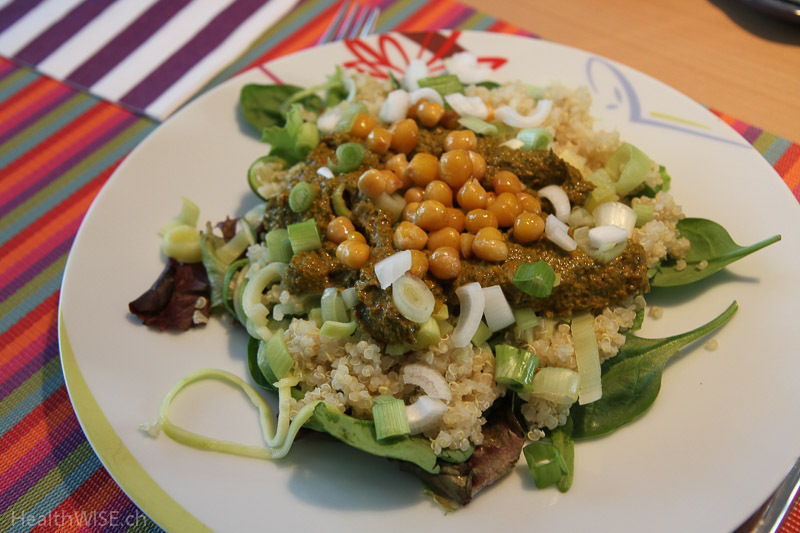 Day 1: Salad leaves, quinoa and zucchini noodles topped with spring pesto, grilled chickpeas and spring onion. The zucchini noodles were made using the latest addition to my kitchen – a spiralizer (thank you, Julia)! It feels like you are sharpening the zucchini, creating very long, curly pieces which have the feel of spaghetti. 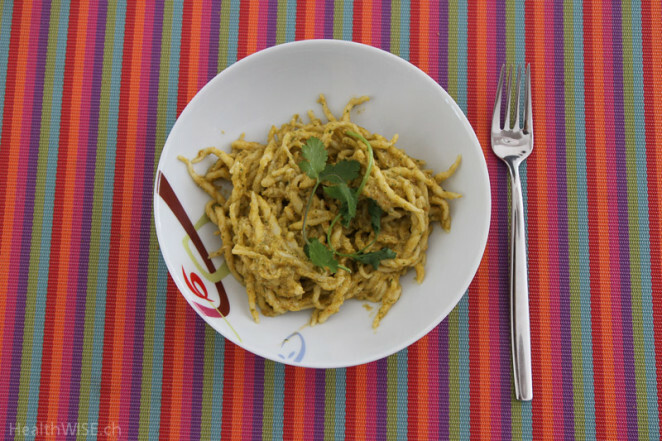 The following day my Italian rooted husband wanted to try the pesto in a more traditional way – with pasta. Pasta cooking tip: Cooking it only until it is al dente and not fully cooked actually makes the pasta healthier, because the Glycemic Index (GI) is lower. The Italians are right about this one! 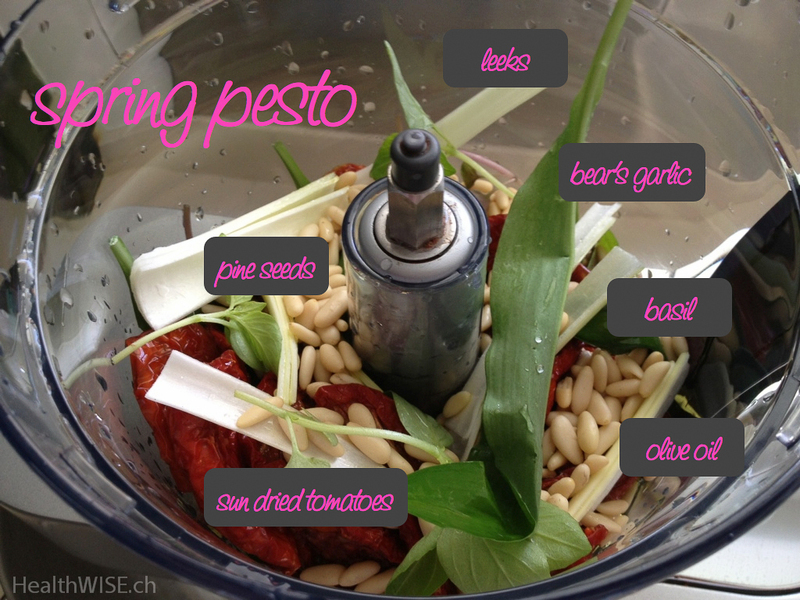 So there you have it, a simple Spring Pesto. Next time, I will make a bigger batch and store it in a jar in the fridge to try with even more dishes! Spring is about birth and rebirth and the hope that comes with new possibilities. All around us, nature bursts into life again after ‘resting’ during the winter, reminding us we can always start over or bring newness into our lives. A key aspect of welcoming the new is removing what no longer serves us and Spring is associated with ‘detoxing’ the body and ‘spring cleaning’ the home. As a key organ of detoxification, the liver is particularly associated with Spring and taking special care of it this season will help us feel lighter and more energetic. During the Winter, we tend to eat sweeter, heavier and more fatty foods which can mean a more sluggish digestion and metabolism. This leads to toxins being ‘stored’ in fat reserves and results in more toxins being accumulated in Winter than any other season. And while our bodies are naturally able to detox, they sometimes need a little help, especially at the start of Spring. ♦ For at least 1 week, avoid dairy, fried and processed foods, alcohol and caffeine, white sugar and white flour. ♦ Drink a glass of warm water with either 1/2 lemon squeezed in or 1 tablespoon apple cider vinegar first thing in the morning. This simple act helps stimulate the liver and kidneys while while flushing the digestive system. If you try nothing else, try this! ♦ Before breakfast, mix 1 tablespoon of psyllium seed husks, chia seeds or linseeds into a glass of water and drink, following by a second glass of water. These seeds act like brooms for your intestines, helping to ‘move things along’ and getting rid of old waste. ♦ Exfoliate your skin by dry brushing your body before you shower using either an exfoliating glove or a natural soft brush. ♦ Finish your shower with cold water to stimulate your lymphatic system which is involved in elimination/detoxing. ♦ Add movement into your life that allows you to sweat. Sweat is a great way for our bodies to release toxins. ♦ Get enough sleep and go to bed before midnight: The liver does its work of detoxing when you are sleeping, particularly between 1 and 3 AM. The color of Spring is green – a color linked to healing and vitality, balance and renewal. Revitalize yourself after the long winter by being in nature as much as possible. Food-wise, add cleansing foods into your diet, particularly fresh fruits and vegetables that are raw or steamed. Try in particular to include green vegetables like spinach, asparagus, artichoke and arugula. The bitterness of these foods helps support the liver. As foods that hold the potential for new life, sprouts and seeds are also a great addition to your diet during this season. New beginnings imply letting go of what no longer serves us. Take a look at your life: Are there any thoughts, people or activities that are holding you back? 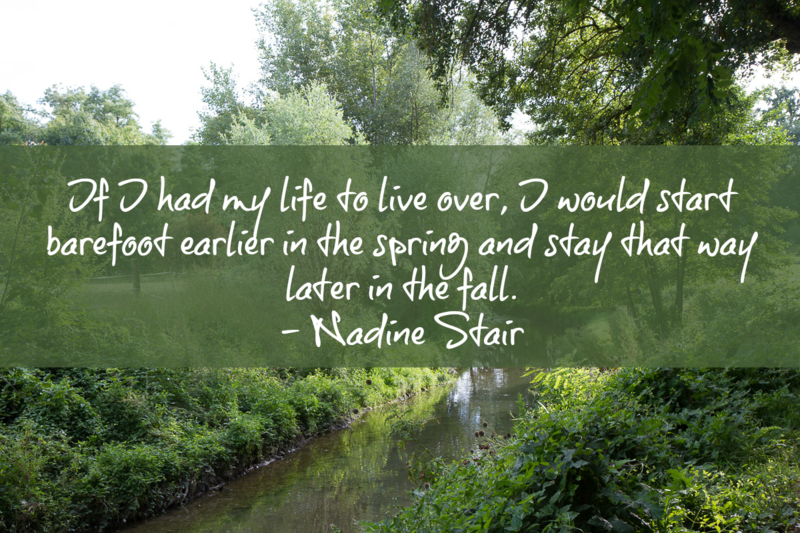 How will you reinvent yourself this Spring?